Many fight on the digital battlefield in the game - Call of Duty. The shoot-em-up game is additively fun, hooking boys and men around the world into hours of gaming. But we are called to a greater purpose than sitting on a chair and stirring at a computer screen. "For the weapons of our warfare are not carnal, but mighty through God to the pulling down of strong holds." - 2 Corinthians 10:4. There's a real battlefield out there, fought with spiritual weapons by God's faithful. Join the fight, throw a prayer grenade, fire an act of kindness and command authority. You are called to duty. T-Shirt Text: For the Weapons of our Warfare are not carnal, but mighty through God to the pulling down of strong holds. 2 Corinthians 10:4. Called to Duty. Weapons Of Our Warfare T Shirt: Black, Adult Small was published by Kerusso in September 2012 and is our 40204th best seller. The ISBN for Weapons Of Our Warfare T Shirt: Black, Adult Small is APT1119SM. Be the first to review Weapons Of Our Warfare T Shirt: Black, Adult Small! Got a question? No problem! 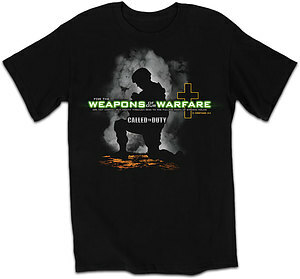 Just click here to ask us about Weapons Of Our Warfare T Shirt: Black, Adult Small.